It's amazing what happens when you connect with a Unilock Authorized Contractor. A few minutes later, you’re making an appointment with the landscaper who is going to design and build your dream backyard and finish off the rest of the property with a new interlocking driveway and walkway to the front door. That’s how, Martin Ivach, the owner of Green Ace Landscaping in Oakville ended up at 528 Brookside in south Oakville last February on a wintery afternoon looking at a snow-covered backyard adjacent to a brand new $2 million-plus home – one of many new complete rebuilds taking place in the now trendy Fourth Line neighbourhood. After his on-site meeting with the homeowner, a doctor at the local hospital, Martin headed back to his offices and computer, where Unilock Uvision 3D software is used to create an initial layout. From there, the project is refined, stone choices are selected, materials are ordered, and the project is scheduled in full consultation with the owner. “One of the first things I tell property owners in that we need to build a solid base, because what goes under the stone determines whether a project is going to last three years or 30 years. 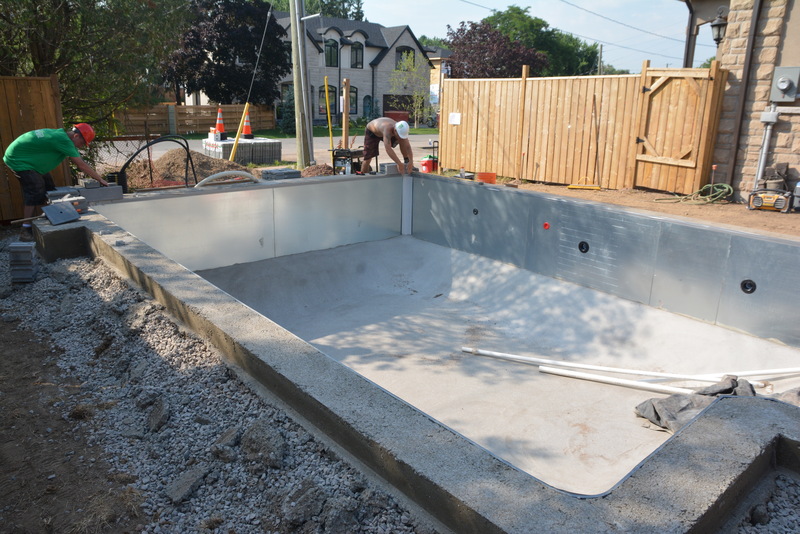 It’s the most critical part of any project and if you don’t get it right the design will eventually crumble,” Martin says, noting they build a 9” open graded base to ensure proper drainage. Each project is one-of-a-kind. Martin likes to bring his creative juices to each design. He’s never backs down from a new idea, in fact it’s the challenge of building something new that drives him and the business to grow and prosper. You name it, Martin has done or is doing it, handling only two to three projects at a time with about 12 dedicated full-time employees. Green Ace Landscaping uses only the very best materials for all of its projects such as; Enduracolor Plus Architectural Finishes for everlasting beauty thanks to proprietary blends of some of nature’s highest performing minerals such as granite and quartz combined with manufacturing technologies that are exclusive to Unilock. Unilock Authorized Contractors are part of an elite group whose work and business practices have met demanding standards. Unilock conducts on-site inspections of contractor’s work and client satisfaction reference checks before a contractor is considered for the program. These inspections continue annually. All Unilock Authorized Contractors offer a minimum two-year guarantee on their workmanship that is backed up by Unilock as well. For more information about the Unilock Authorized Contractor Program and what to look for when choosing a contractor CLICK HERE. 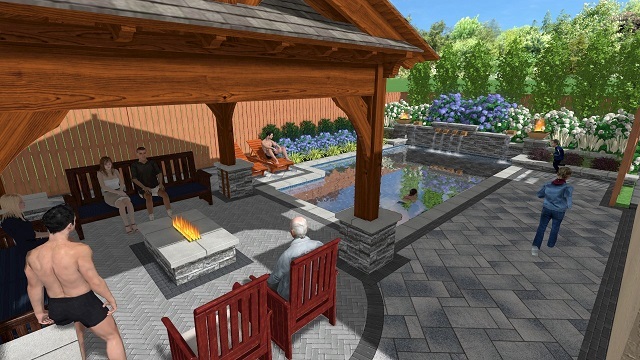 The Brookside Drive backyard highlights include; 1,200 square feet of stone design, a pavilion with a gas fireplace, a side wall with garden areas and the most extravagant water feature he’s ever built with pillars and fire bowls at one end of the new pool. 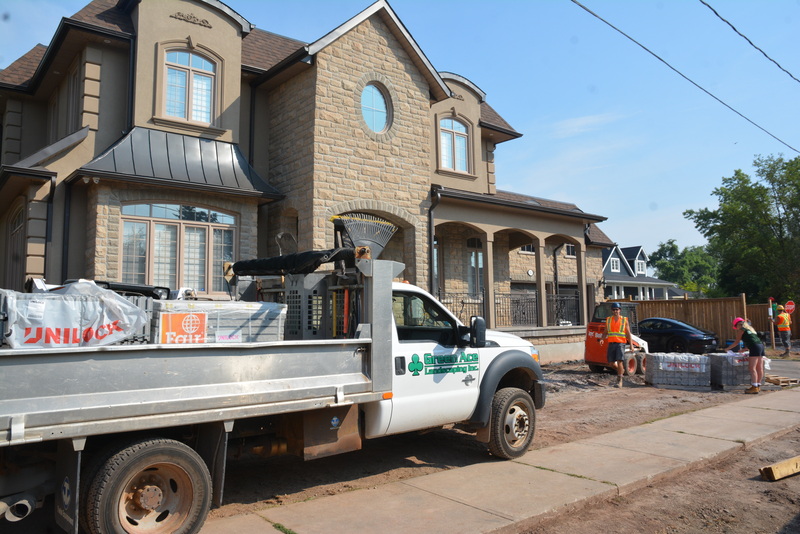 Then Green Ace Landscaping started doing its thing in mid-July with an expectation to have the project completed over the next six weeks. 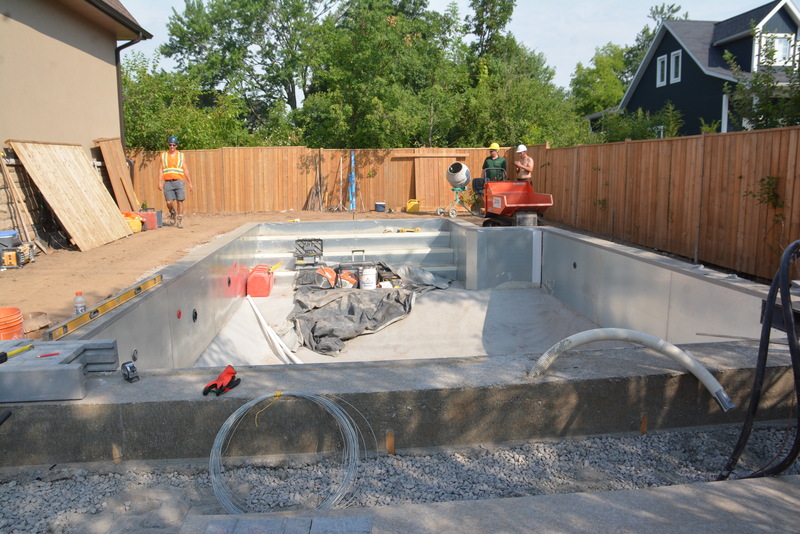 They will also finish off all of the exterior landscaping around the front of the house of the corner lot including a new driveway and front walkway. 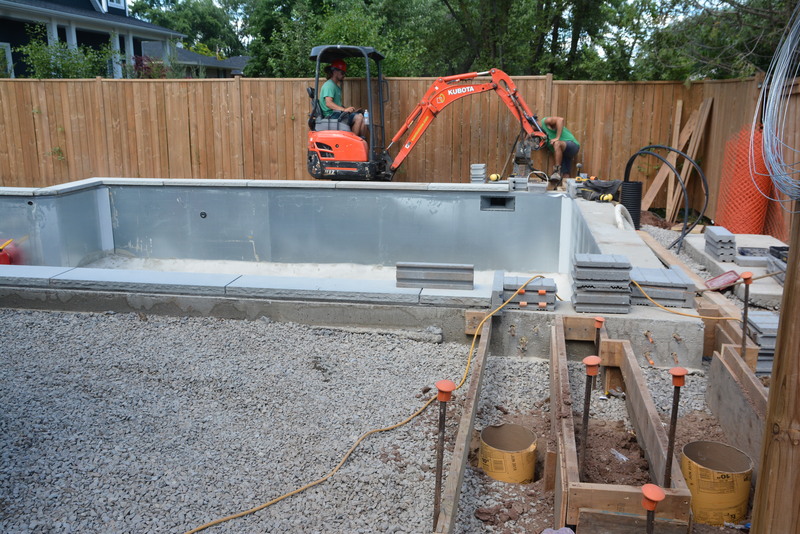 Over the next six weeks, we’ll be checking in with Green Ace Landscaping and Unilock to see how the project is progressing and share a few of Martin’s secrets when it comes to landscape design and build with the best stone in the business.